TO BOOK/CREATE A SPECIAL EVENT PLEASE EMAIL INFO@GOMADDOGS.COM AND YOU DO NOT NEED TO FILL OUT THIS FORM. YOU WILL STILL NEED TO FILL IN A WAIVER AND YOU WILL NEED TO WEAR A HELMET. 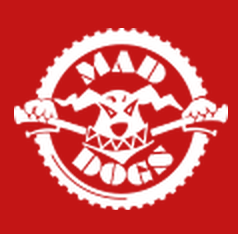 Would you like a FREE Mad Dogs cycling jersey? YES - I understand I commit to wearing it for at least part of the event and the victory photos NO IF YOU WOULD LIKE A FREE JERSEY YOU PROMISE TO WEAR IT FOR AT LEAST PART OF THE EVENT, AND THE FINAL VICTORY PHOTO! Men's XXS (82-85cm) Men's XS (86-89cm) Men's S (90-93cm) Men's M (94-97cm) Men's L (98-102cm) Men's XL (103-107cm) Men's XXL (108-112cm) Men's XXXL (113-117cm) Women's XS (82-85cm) Women's S (86-89cm) Women's M (90-93cm) Women's L (94-97cm) Women's XL (98-102cm) Women's XXL (103-107cm) Cycle shirts tend to be very tight fitting - if you prefer a looser fit, choose a larger size. SHIRTS ARE MADE TO ORDER AND THEREFORE ONLY GIVEN TO THOSE WHO HAVE FILLED THIS FORM AND PAID, 30 DAYS BEFORE THE EVENT'S FIRST DAY. Yes please - sign me up! (I realise I provide my own AA batteries) No thanks, I have my own / I'm borrowing one from a friend. I realise that carrying a GPS is compulsory. Should I break or lose the GPS unit, I acknowledge that I will be liable to pay for a replacement. I also realise that, aside from the initial day (when these are provided), I will need to provide 2 AA batteries each day to operate the unit. Would you like to include airport transfers? Do you want to pay a supplement to guarantee your own room? You can conveniently to pay your registration fee by Paypal. On submission of the form you will be directed to Paypal. IF YOU DON'T WANT TO USE PAYPAL, LEAVE THIS SECTION BLANK. Full amount Deposit - only available if booking more than 60 days in advance. Are you registering as part of a group? Do you want to pay for just yourself, or all members of your group? This helps us to pair people up appropriately in accommodation. Help us reach the right people! Can you remember what your Google search terms were? Could you tell us your referrer's name? You met us? Great! Where was that? Where did you see us in the media? Submit form and bring on the challenge!